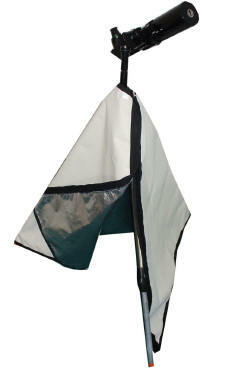 Custom sized table covers, 365 Series Covers for 6" & 8" Dobs, 10" Dobs, 8" & 10" GEM mount Newtonians, LightBridge covers. 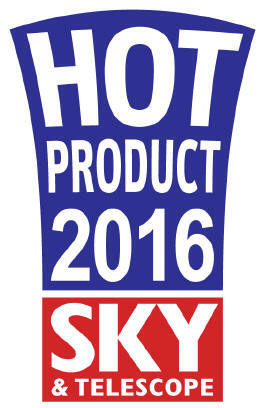 TGSO...Solar Observing Hood...selected to Sky & Telescope's 2016 Hot Product list...thanks S&T! The TeleGizmos Solar Scope Cover is a multi-layer, polyethylene material with a fully aluminized surface. The heat reflective ability of the cover is extremely high with a material strength equal to a multi-layer light weight tarp. Temporary outside storage not to exceed more than occasional, short term outside exposure. 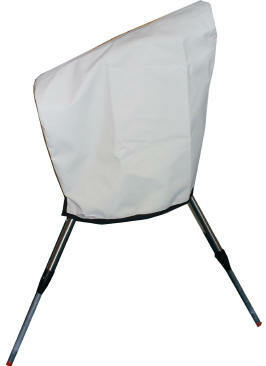 For long term outside usage (periods in excess of 1-2 weeks continuous exposure) our 365 Series covers are recommended. We also can produce custom sized covers for almost any type of application Let us know what you need and we will work with you to produce it.